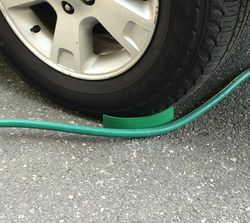 The Hose Slide is the amazing device that prevents your water hose from becoming stuck under your tires as you work your way around the vehicle during the washing process. This small piece of plastic will save you a lot of frustration when you wash your car! The Hose Slide is a simple in design, and huge in function. Once in place, it allows the hose�or power cord�that you are using to glide around the car without getting pinched under the tires! If there�s one thing that every level of detailer�from complete beginners to seasoned professionals�can agree on, it�s that the minute you move from one side of the vehicle you�re washing to the other, your hose gets trapped under the tires, sometimes to the point of kinking and stopping water flow completely. You may have made peace with this problem, thinking of it as one of �those things� that just happens. The Hose Slide eliminates this problem so you can get your vehicle clean and ready for polish! If you�re a fan of machine polishing, you�ve probably experienced this problem with your buffer�s power cord as well. A stuck power cord could catch mid-polish and cause burn-through or marring�a detailer�s worst nightmare! Not to worry, the Hose Slide will keep the power cord from your polisher from getting stuck too, so you can work around the vehicle more easily. The Hose Slide is made of durable molded plastic that cups the tire where it meets the ground. To use it, simply push it under the tire diagonal to the tread using your foot. The simplicity of the design will make a big difference in the efficiency of your detailing routine! The Hose Slide includes 2 separate slides, one for each of your from tires, and they stack for easy storage. Use your Hose Slides for your water hose, air hose, and power cords when you�re working on your vehicle and avoid the frustration of kinks and snags!